Yesterday, Michelle Obama rocked this $2000 Sophie Theallat shirt-dress to some meeting or presidential gathering (This is FABGLANCE not CNN). Anyway, I need $2000 so I can get one too – you can deposit it into my PayPal account! 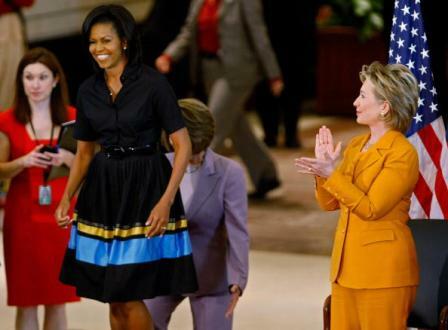 Just playing, but Ms. Obama looked very classy, with a pop of color, yesterday, especially next to Hillary Clinton. Why on earth is she wearing a MUSTARD colored pants-suit? Little background on Designer Sophie Theallant – She is a french designer who is most noted for using an all black cast to walk in her Spring 2009 RTW show. Good Deal!! I love my First Lady…and you’re right, that dress is really cute!